We were on our way to an appointment this morning and I snapped this photo to show how much this area of the country differs from our daily route in San Jose, California. Where’s the other lane, you say? If you were coming the other way on this road, we could probably squeeze by each other with a little care and a friendly wave. If you look at this picture again, you will see that we were making good time. All of the nearby trees are blurred. It is a gravel road and the county scrapes it frequently enough so that the dreaded washboard effect doesn’t last very long. There are roads nearby where the soil and the drainage seem to work together to produce instant washboards. Your car’s suspension is at risk if you drive those roads often. This is a major highway compared to Goose Creek Run which runs by Fred First’s house on the other side of the county. 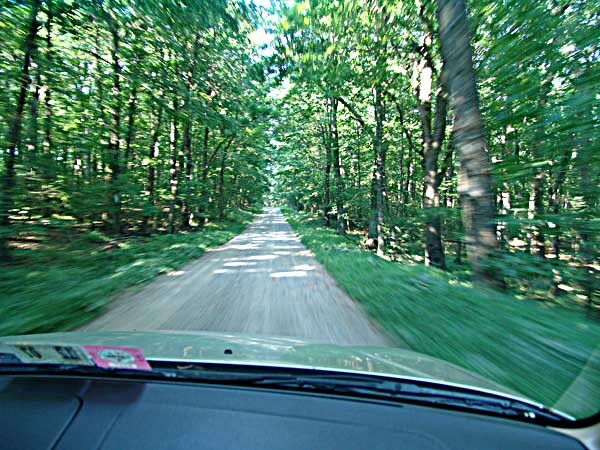 On that road, you can reach out and touch the underbrush on either side in the lush summer months. If you meet someone coming the other way, one of you has to back up until a wider spot is found. We spent a long time finding this part of the country where we could commute on roads like this and live at a slower and more satisfying pace. There is a lot more to see and there are enough open roads that we don’t have to drive bumper to bumper. In a rapidly evolving world, we take every moment to be thankful for the remaining miles of country road that still exist. Next time you are in a road like this, treasure the moment. This entry was posted in Seen around Floyd and tagged country road, Floyd County Virginia, one lane country road. Bookmark the permalink. Sounds like something out of a dream for an urbanite like me. Enjoy while it lasts, I’m sure people are planning to visit that part of the countryside soon. I love country roads. That’s a beautiful spot. I am in Vermont a lot and many roads are still dirt roads.